While it looks like the march toward establishing a right-wing dictatorship in the USA has slowed down a little bit, what with one house of the US Congress no longer controlled by the Trumpist Party, you wouldn't know that in Fernley or in Lyon County. To nobody's surprise, the Republicans polled in excess of 70% in most races except those where they got 100% because there was only a single person on the ballot. It would appear that there might be 20% of the local Fernley electorate who are not full-blown Trumpists, because the advisory measure that would have directed the city council to ask the state legislature to allow the city to impose a 5 cents/gallon diesel fuel tax to pay for road maintenance almost got 50%, but appears to have come up just short. The proposal to increase property taxes to help fund more fire fighters (I worked out that it would have cost me about as much as one take-out large pizza per year.) lost more thoroughly (60/40). I guess those people voting no don't care if their houses burn down or if nobody comes when they fall or have a heart attack. It's not as though the people here don't want their streets improved, though. They just don't think they should have to pay for it, because they are the most heavily taxed people on the planet, at least from the way they talk. 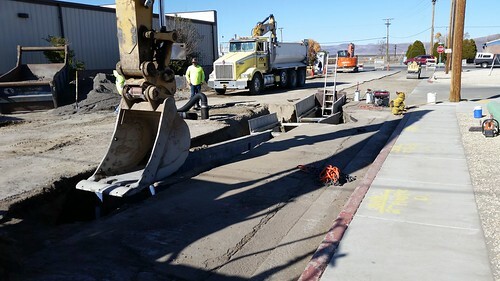 There's a long-delayed road-and-utility improvement project just under way here, paid by a mixture of various grants and some local money. It's taken years to get started. This is Hardie Lane, which runs in front of the post office, from where I took this photo this afternoon. It looks like the contractor will be slowly moving south doing utility trenching before coming back to do the repaving and curbing, and I hope putting in sidewalks. I read some of the locals saying they don't see why they should have to pay to have streets paved, because they drive big old 4WD trucks that can drive over anything. This sort of thinking IMO leads to saying, "I don't need a fire department! If my house catches fire, I'll put it out myself!" But I suspect that if their home burns and they survive, they'll immediately start yelling about how the lazy fat firefighters didn't save their homes. Oddly, I consider taxes to pay for roads and fire protection a conservative thing to do. It's very much TANSTAAFL. You want the services? You need to pay for them. But I still see people acting as though Fernley was a little town of a few hundred people instead of a small city of 20,000. Errors made by past local administrations are coming back to bite this city hard, and none of the people who made those decisions even live here anymore! There was one local issue where the vote went the way I voted: Lyon County 1, "the Brothel Bill," which if passed would have called upon the county government to ban brothels. There are several in Lyon County, all over near Carson City. If you ever watched HBO's series "Cathouse," you'll have seen them, because the Bunny Ranch is one of them. All of them were part of Denis Hof's holdings. Hof, you may have heard, was running for a state Assembly seat, died just before the election, but was elected by a landslide anyway. As I heard it, at least one of the Lyon brothels had to close because Hof was the sole owner and their license was suspended upon his death. But anyway: While I'm not one of their customers, I do not have a problem with licensed, regulated brothels, just as I don't object to alcohol, tobacco, or marijuana use, even though I don't use any of those substances myself and don't have them around me. Looking at the statewide election results map: If land voted (rather than people), Nevada would be running under an absolute Republican dictatorship. However, most of the people in the state live in Las Vegas and Reno, and most of them voted Democrat, and thus Nevada had a Blue Sweep (except for the Secretary of State), electing a Democratic governor, senator, and a majority in both houses of the legislature, albeit by only one vote in the state senate. I have no doubt that the people in the other counties like my own are seething at having the Democrats in charge. I, however, am relieved. There were other good results from around the country. It shouldn't have been on the ballot in the first place, but thank goodness Massachusetts supported the rights of trans people, and by an enormous (>two-thirds) majority. There were other good results out there as well that shows that not every voter is a would-be jackbooted thug ready to kill anyone who isn't a White Conservative Man. And finally: I'm very gratified to see that despite so many cases of voter suppression and possibly out-and-out fraud, it looks like the Republicans were not actually able to engineer a miraculous case of 435 Republican House of Representatives members. That is, it looks like results were actually relatively honest in many places. I've been worrying about that. We're not out of the woods, not by a long shot. I have some hope that the few remaining Republicans with any honor might see pretty soon that being a Trumpist doesn't pay. We can but hope.